0% Int. for up to 3 yrs and 20% OFF All Windows! Click here to listen to our Window Buying Guide! Why Buy Windows From Guida? Our experienced sales consultants will diagnose your existing window problems and help you decide which options are best for your home with an upfront and honest approach. Guida has an exclusive on the beautiful Elements Window by Soft-Lite, which is rated one of the most energy efficient, air-tight windows on the market! Enjoy feeling the peace of mind behind the Lifetime Warranty of an Elements Window that includes everything from the actual vinyl, insulated seal, moving parts, and even glass breakage. Our high performance triple-pane glass package with Low-E & Argon on the Elements Window outperforms typical double-pane windows! Every possible main-frame and sash chamber is fully insulated with softly expanding, environmentally friendly polyurethane foam insulation, which improves the overall thermal performance of Elements Windows. Elements windows are only produced with SUPER SPACER - the world's only 100% foam, Metal Free Warm-Edge sealing system, providing the best resistance to condensation and seal failure, as well as improved thermal performance over typical metal spacers. Sculpted interior and exterior design delivers a refined new look. The authentic cove-mold wood design produces a beautiful window while the slim profile maximizes your view. This tilt latch and lock system completely eliminates the traditional, unsightly tilt latches and enables easy, one-touch tilt-in operation. This sill features a neoprene gasket that straddles a rail under compression and works with triple-fin weather-stripping for a tight seal. A mechanical interlock holds the bottom of the sash in place under severe stress. This innovative triple-fin weather-stripping features anti-microbial biocide that provides high protection against mold, mildew, airborne bacteria, and pollen. This also contributes towards Elements having the best Air Infiltration rating on the market! Heavy-duty Teflon®-coated stainless-steel coil balance system. This balancer has a Lifetime Warranty and is the quietest, smoothest way to open and close a window! For the ultimate in durability, the Kevlar-reinforced meeting rails is five times stronger than steel, and over 700 times better thermally than aluminum. K-Beam will not transfer heat or cold through the window as common metal reinforced windows do. Best Air Infiltration Rating on the Market! Don't buy a so-called "energy efficient" window without knowing it's Air Infiltration Ratings. The Elements window's 0.01 CFM rating it so superior that it leaks only a fraction of air compared to all other typical vinyl and wood windows! Both of our grid styles come in all the interior and exterior colors. Your home will be completely color matched! All contour and flat grids are contained within the insulated glass. 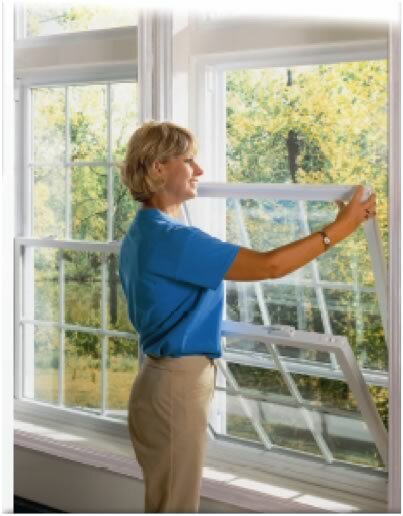 Double hung windows are famous for their ease of cleaning and classic look. Add in their durability and energy efficiency, and it’s no wonder the double hung window is so popular! A sliding window, also called a slider, has a sash that opens horizontally to let fresh air in. The sliding window has a more contemporary look to it than a double hung. A casement window hinges along one side and swings outward using a crank mechanism. The tight seal that is formed when a casement window is closed makes casements the most energy efficient windows on the market. Use a vinyl picture window to frame a beautiful outdoor view, or to incorporate into a dramatic wall of windows. Available in many sizes, a picture window can be the perfect addition to your home. An awning window has a hinge along the top, allowing the window to open outward and air to flow up and in. Awning windows are great for places where you’d like to keep the window open in light rain. Bay and Bow windows are combinations of casement or picture windows that project outward from the home. They add extra light to the room and expand interior space. Popular for kitchens, garden windows add light and space while projecting outward and opening at the sides for ventilation. Geometric windows can be curved or angled to fit almost any shape. From circles to triangles and almost anything in between, a geometric window can be made to fit your space.